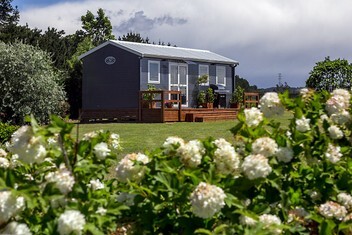 Eco Cottages are the best value portable tiny house or building in NZ. High quality engineered steel framed buildings,­finished to a high end interior. First home, granny flat, teenage flat, rental, farm house, worker huts, holiday bach, shop, office, clinic or restaurant­. Transporta­ble NZ wide at relative low cost. In stock, or to order. Please contact us. Display village located at Sefton, by appointmen­t only. The new age solution to portable housing at an extra-ordinary base price of $57,000 [inc. GST]. This space saving "tiny house" has loads of inbuilt storage with a high end top cupboard kitchen & pantry, in-wall shelves, new age ensuite [or traditional], dual wardrobes & above bed shelving, utility cupboard and other storage potentials. Highly engineered, full steel chassis, dual telescopic towbar, triple axle with 6 tiny radial wheels, heavy steel frame, roof beams, attractive gable roof with high end guttering & downpipes. High gable ceiling and super 3.1m width which moves away from the elbow to elbow galley living and claustrophobic crawl spaces that have haunted the traditional Tiny House. Options of double glazing, under-floor insulation, heat pumps, ventilation systems, 75mm in-wall insulation for dry, warm healthy living. The "Rolls Royce" of tiny houses for a "Mini" price. Now introducing the Eco Room, Eco Pod and Eco Glass House [refer photos 16-20] and other modularised options to create larger living spaces. Please phone Colin today on 0276636401.